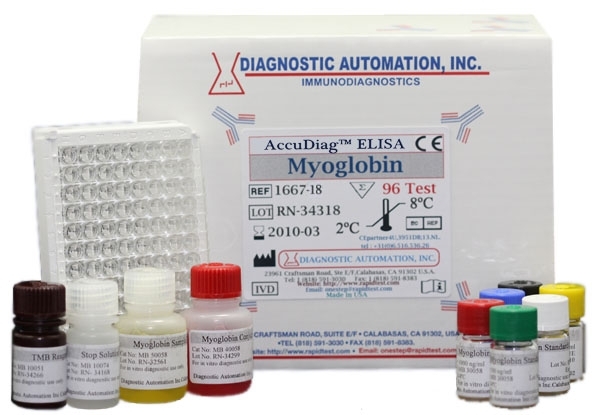 Diagnostic Automation offers a C - reactive protein (CRP) ELISA kit which is an Enzyme Immunoassay for the quantitative determination of CRP concentration in human serum. 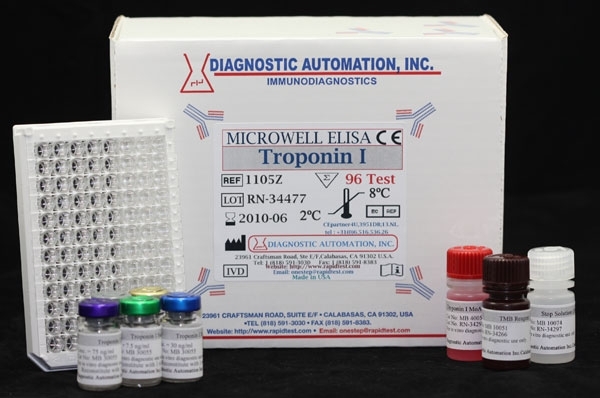 The CRP ELISA kit enhanced sensitivity measurements of CRP can be useful for the detection and evaluation of infection, tissue injury, inflammatory disorders, and associated diseases. The C-reactive Protein (CRP) a homopentameric protein, belongs to the pentraxin family. CRP is an acute-phase protein produced by hepatocytes in response to circulating IL-6, IL-1, and TNF. It plays an important role in host defense as a pro-inflammatory mediator and activator of the complement pathway. Although normal circulation levels are low, they rise sharply within 48 hours of disease or trauma and stay elevated until the resolution of inflammation. 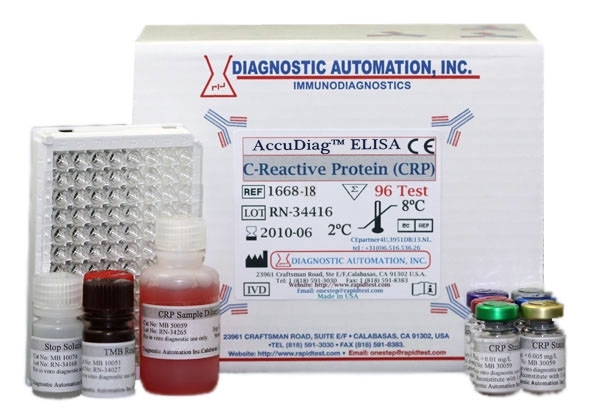 Many pathological states, including rheumatoid arthritis, tissue trauma, viral or bacterial infection, hepatitis, and some autoimmune conditions are a result of elevated CRP levels which can be detected with this highly sensitive CRP ELISA test kit. Its physiological roles are numerous and varied, but with several functions similar to those of immunoglobulins, CRP appears to function in host defense. 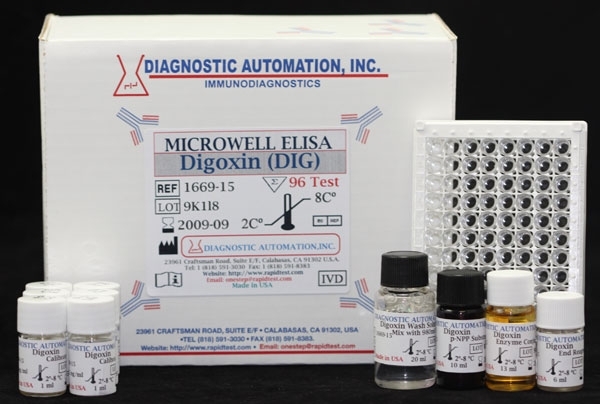 Current testing methods including latex agglutination, nephelometry, and radial immunodiffusion (RID) have the general disadvantages of low sensitivity, whereas ELISA kits provide the highest sensitivity and specificity. 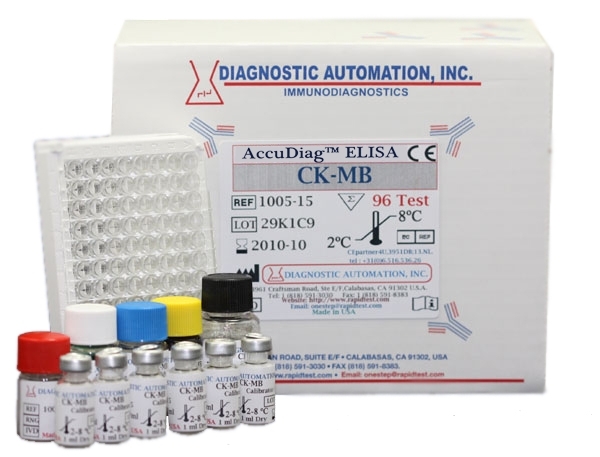 As elevated CRP values are always associated with pathological changes, the CRP ELISA kit provides useful information for the diagnosis, therapy and monitoring of inflammatory processes and associated disease. Additionally, measurement of CRP by high-sensitivity CRP assays may add to the predictive value of other cardiac markers (myoglobin, creatine-kinase-MB, troponin I and T), which are used to assess the risk of cardiovascular and peripheral vascular disease. The CRP ELISA test kit is based on the principle of a solid phase enzyme-linked immunosorbent assay. The assay system utilizes a unique monoclonal antibody directed against a distinct antigenic determinant on the on the CRP molecule. This mouse monoclonal anti-CRP antibody is used for solid phase immobilization (on the microtiter wells). A goat anti-CRP antibody is in the antibody-enzyme (horseradish peroxidase) conjugate solution. The test sample is allowed to react simultaneously with the two antibodies, resulting in the CRP molecules being sandwiched between the solid phase and enzyme-linked antibodies. After 45-minute incubation at room temperature, the wells are washed with water to remove unbound labeled antibodies. A TMB reagent is added and incubated for 20 minutes, resulting in the development of blue color. hsCRP ELISA at 0.1 mg/l CRP; upper limit = 10 mg/l CRP. in one assay. Within-assay variability is shown in CRP data insert. Various patient serum samples of known CRP levels were combined and assayed in duplicate. The mean recovery was 100.4%.